Rain Barrel Workshop. Come Sat July 30 @ 11am to St. Paul’s Evangelical Lutheran Church, 837 Old Bethlehem Road, Haycock Township; (across from the Haycock Fire Station) Quakertown PA 18951. We will not be providing rain barrels, but we will show you how to make and install one, or install a commercially made rain barrel. We would also be happy to help you install one at your residence on Sat afternoon that you’ve purchased before Sat afternoon from a local vender (see the rain barrel options below that can be obtained locally). We (myself – Julie and 2 of my Rutgers U student’s Joseph Todd and Paul Redpath-Perez) plan to also discuss the benefits of organic community gardening, composting and rain water catchment systems (rain barrels). I have researched the costs and types of commercial rain barrels that can be obtained locally. There are also lots to be found on line… If you want one of the models from Lowes, Home Depot, Tractor Supply (Qtown, Rt 309), or Neighbors in Hellertown, feel free to pick up and bring to your house. If you are interested in the models from Neighbors, tell them you are affiliated with the Haycock Wildlife group to get the discount (speak to Glenn – (610) 838-7000). I will be installing the 2 models from Neighbors. I was impressed by the looks of them and the quality – both the Cascada and Madison model have a 20 year warranty and can withstand cold. The Fiskars Tuscany 57-Gallon Rainwater Harvesting System helps collect, store and dispense rainwater from your roof in style. This rainwater harvesting system includes a diverter kit and spigot. 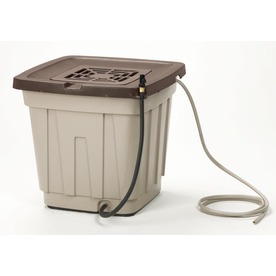 Rain Wizard 50 Oak Faux Whiskey Rain Barrel, 50 gal. Collect fresh, chemical-free, rain water for use on your plants, lawn, and garden, with the Rain Wizard 50 Oak Faux Whisky Rain Barrel. The flat back design allows you to set it flush against exterior walls. The anti-debris screen keeps out pests and is safe to the touch. A rugged brass spigot is included to accent the barrel with charm and class. Neighbors Lawn and Garden (Hellertown) – I have arranged with the owner Glenn Panick (610) 838-7000 of Neighbors, Lawn & Garden, 38 S. Main St., Hellertown for discounted prices (shown below)(tell him you are part of the Haycock Wildlife Habitat group). A flat, yet elegant 49 gallon (185 L) rain barrel that fits up against any home! 20 yr warrenty on the barrel. The Madison rain barrel can also be upgraded to the Madison fountain with our fountain upgrade kit! 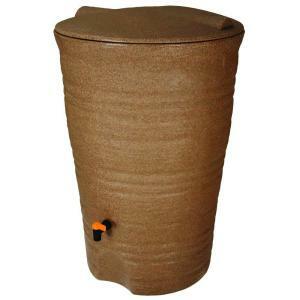 Item #: 81001 (terracotta),Cascata Rain Barrels combine the timeless aesthetic elegance of ceramics with the enduring longevity of modern plastics. The Cascata is made of a roto molded plastic that is able to withstand extreme temperature and will not chip, crack, or fade. 20 yr warranty!!! 65 gallon rainsaver container with a screen guard and unique easily removable crown planter on the top – double walled for extra strength and durability.